L.A. Sheriff’s Transit Bureau North Deputies and Pasadena Police Officers saved the life of a man who was choking while eating dinner. Deputy Arnulfo Aguirre (left) and his partner Deputy Vladimir Vasquez-Flores (right), are currently assigned to the Metro Gold Line. 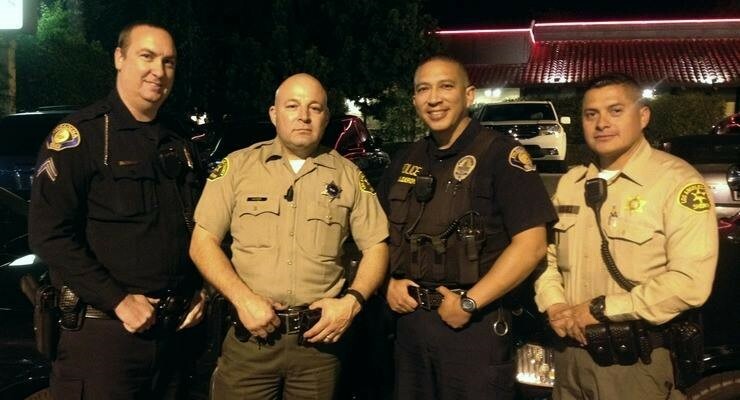 The deputies were on their dinner break at the Stonefire Grill in Pasadena, California when the incident occurred. Seated nearby, were Pasadena PD Officers John Calderon and Tom Blanchard, also on their dinner break. Deputy Aguirre noticed a male waving his hands in the air in obvious distress. Mr. Jonathan Staffeldt, who was dining with his family, was choking and unable to breathe. Aguirre ran towards Mr. Staffeldt and began to administer abdominal thrusts to dislodge any obstruction. After approximately ten thrusts, Pasadena Officer John Calderon took over and delivered a few more abdominal thrusts. Their efforts proved successful as the food obstruction was dislodged and Mr. Staffeldt was able to breathe again. This is not the first time Deputy Arnulfo Aguirre has saved a life. On November 18, 2012, Deputy Arnulfo Aguirre and another deputy responded to the Whittier Narrows Recreation area regarding a baby not breathing call. The deputies were the first units to arrive at the scene, and they quickly determined the baby was not breathing and did not have a pulse. Deputy Aguirre quickly placed the baby on the trunk of his patrol vehicle and began performing chest compressions while Deputy Ledesma performed artificial respiration. They administered CPR until the Fire Department arrived on scene and began treating the baby. The baby was rushed into the emergency room and the medical staff successfully revived the baby. Sadly, it was determined the baby was a victim of child abuse and suffered major injuries. Based on the professional opinion of the intensive care doctor, the baby survived due to the quick application of CPR and rapid response to the hospital. The deputies and officers lack of hesitation, value for human life, compassion and training made the difference in saving a life. For their bravery and heroism, it is with great pleasure that ALADS salutes our members for their teamwork and decisive action under very stressful conditions.